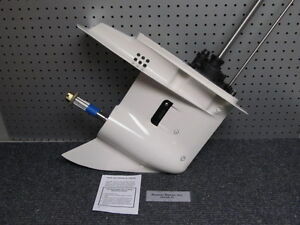 1989-1992 Johnson Evinrude 20" Lower Unit 40 48 50 HP 2 cyl 1 YEAR WARRANTY! premiermarineparts has no other items for sale. JACK PLATES MANUAL & HYDRAUL. PAYPAL ONLY. PICK-UPS POSSIBLE. FLORIDA BUYERS MUST PAY FLORIDA SALES TAX (7%). YOU MUST CONTACT WITH YOUR ZIP CODE, THE SHIPPING AMOUNT STATED $ 85.00 AT THE TOP OF THE AUCTION IS THE MAX FOR CONTINENTAL US. YOUR SHIPPING MAY BE LOWER. No return for units that have been installed on engine unless you are submitting a warranty claim.